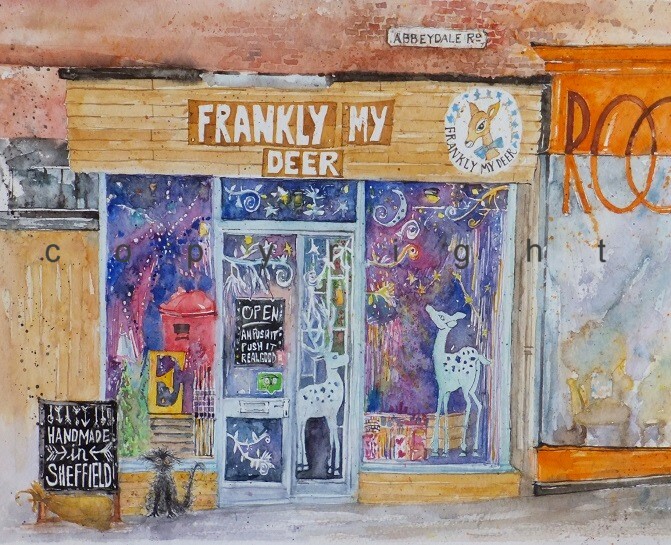 This entry was posted in Art, Sheffield, Sheffield - watercolours, Shops and tagged Abbeydale, Antiques, art, Cards, Gifts, Made in Sheffield, Prints, Quarter. Bookmark the permalink. 7 Responses to … Frankly …. My Deer ! ….. I hope the exhibition went well Victoria ! Sashenka looks a rascal of a dog and full of character … War and Peace is one of those programmes I’ll have to catch up with in time . The colours in your painting are much cheerier than the real thing. Lovely work.